1 BRING water, milk and margarine to a boil in 2-quart saucepan. 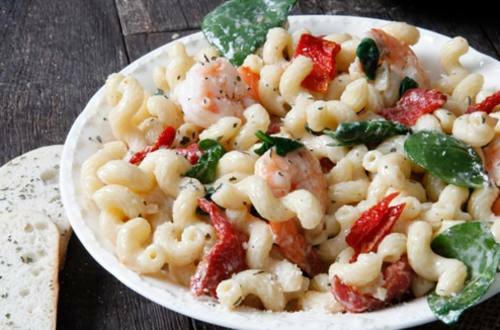 Stir in Knorr® Italian Sides™ - 4 Cheese Pasta and sun-dried tomatoes. Continue boiling over medium heat, stirring occasionally, 8 minutes. 2 ADD shrimp and continue boiling 4 minutes or until shrimp turn pink and pasta is tender. Stir in spinach; now it's delicious. Dig in!